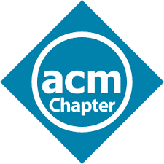 The Poughkeepsie Chapter of the ACM is always seeking speakers who can give informative talks to a friendly, informal, technical audience of 15 to 25 programmers and computer engineers. Most of our members have advanced degrees in technical fields related to computers, and many have themselves given talks to the group. We email meeting notices to over 500 technology-oriented individuals and organizations in the Hudson Valley. A talk to the Chapter is a good way of making contact with this community. The Chapter does not pay an honorarium, but it does invite the speaker as a dinner guest at 6:00 PM on the evening of the talk at the Palace Diner, not far from the meeting room. Our speakers have talked on diverse topics from state-of-the-art software and hardware technology to high-tech business startups to history of computers to STEM coursework. Recent talks can be found in our list of meetings. Our meetings officially start at 7:30 PM, but actually end up starting around 7:40 PM. Talks are expected to take an hour or so, with questions and discussion following until about 9:00 PM. At that point we break for informal discussions and networking often lasting past 9:30 PM. Speaker's name, as it should appear on the meeting notice. One or two paragraphs describing the content of the talk. One or two paragraphs describing the speaker. Examples of the above items can be found in our list of meetings. Chapter meetings are held at Marist College, usually in Room 2023 of the Hancock Center or in Room 3105 of the Student Center. Both rooms are equipped with state-of-the-art presentation facilities, including a projector driven by a Windows computer with broadband internet access, USB port for flash drive input, and audio output. The most convenient physical connection is with a USB flash drive containing powerpoint, PDF, or other files. External laptops can be connected, but only by special arrangement made well in advance with Marist's Media Center. After most talks, speakers have generally provided the webmaster with a PDF of their foil presentation, for posting on this website.